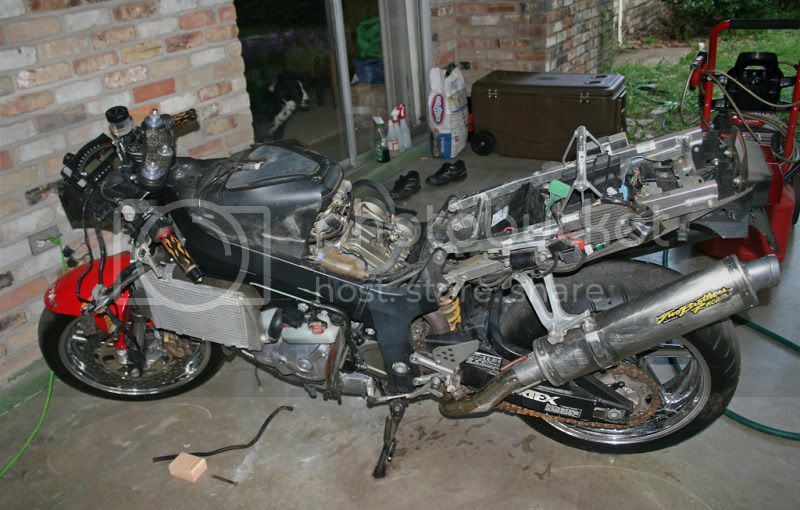 Speedzilla Motorcycle Message Forums > Special interest > Project bikes > Wrecked 2001 RC51 Project "Stitch"
Wrecked 2001 RC51 Project "Stitch"
Picked up a wrecked 2001 Honda RC51 a few weeks ago. 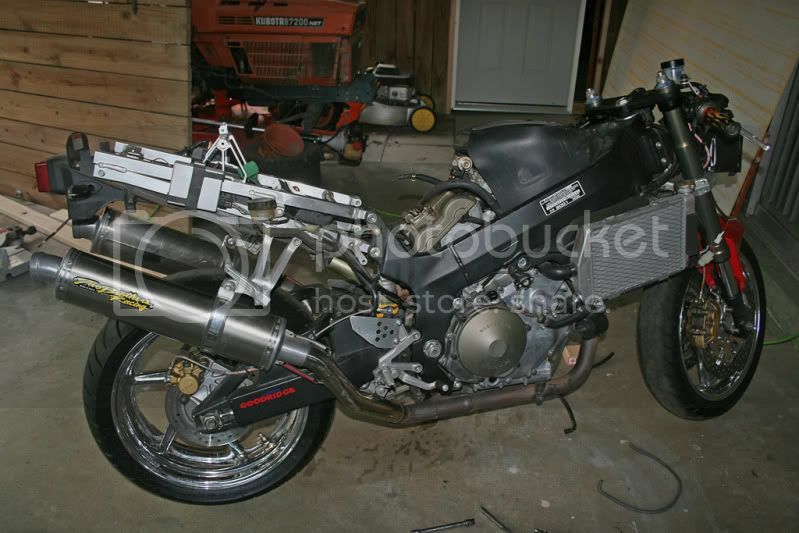 Sold my SV650 to fund the project, looking forward to a larger engine after selling my R1 a few years ago. As it arrived. Beat up and riced. But it starts and runs good! 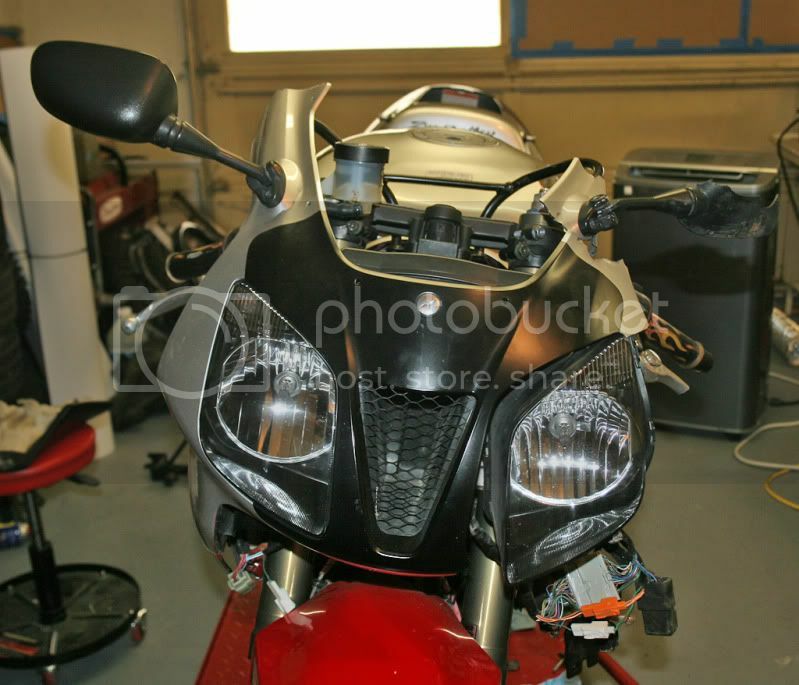 Will be receiving a whole new fairing set. Previous owner wrecked it, stopped paying on it, and it was repo'd and sold at auction. Clear title. I think "Stitch" is a fitting name for two reasons. A rebuilt wreck and looks like Stitch from Lilo and Stitch. Fork seals blown, have a new set on order for $25. Probably trade chrome wheels for some stockers. The better side, but it has been down on this side before. 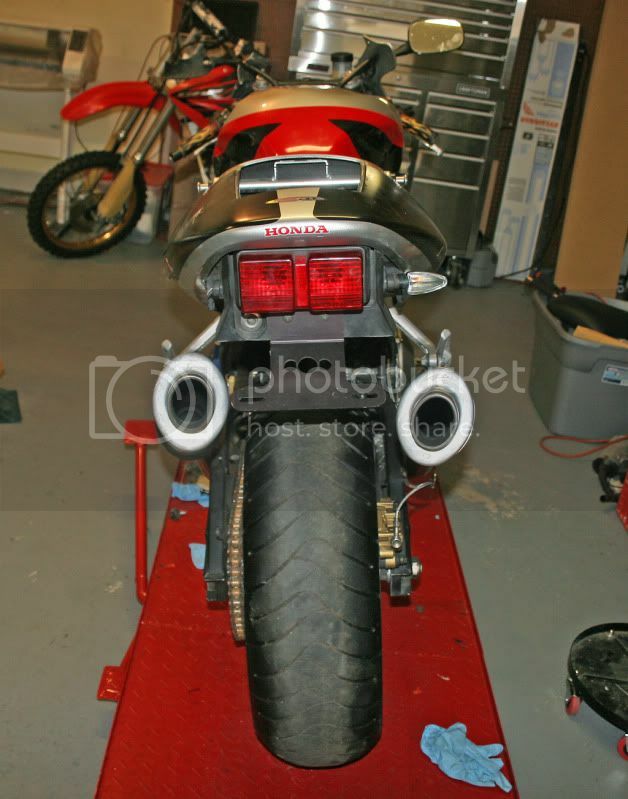 Two Brothers exhaust sounds good, but pretty janky with broken exhaust hangars. Road rash on the left pipe and can. 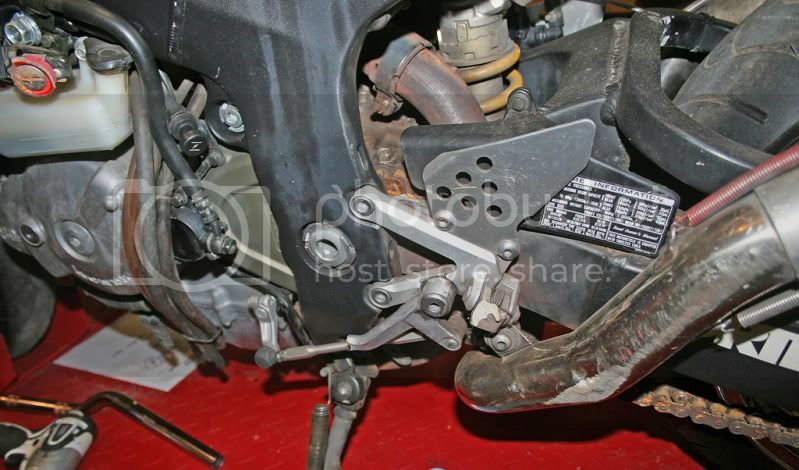 Left rearset broken and bent in. 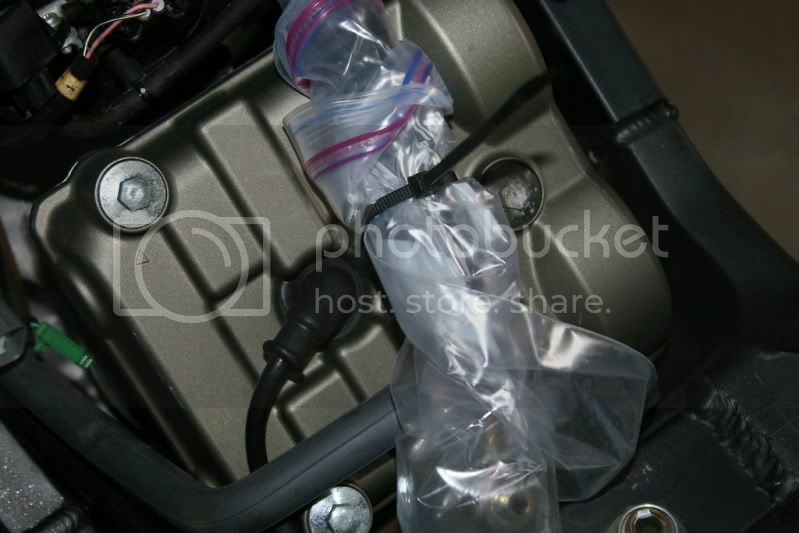 Need to replace the reservoir and lever. Huge dent in the tank, looking for a used tank to replace it with. Chain and sprockets are toast. Previous owner must have never cornered this poor thing. 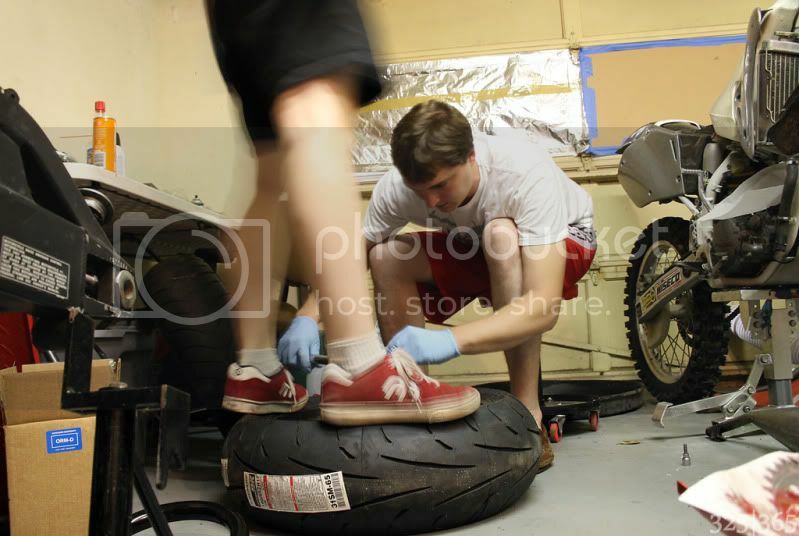 And the tires still have TIRE SHINE on them! Really? That's probably why he went down. 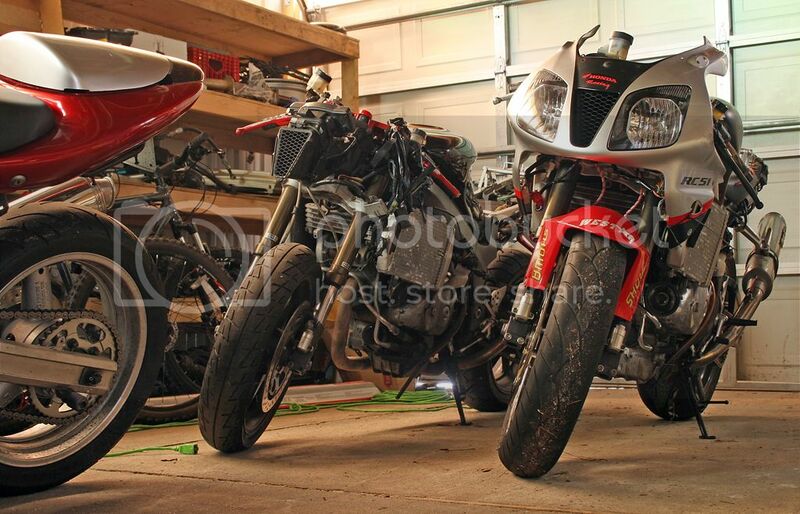 Damaged left and right OEM fairings to repair and paint, still need to find a front fairing. 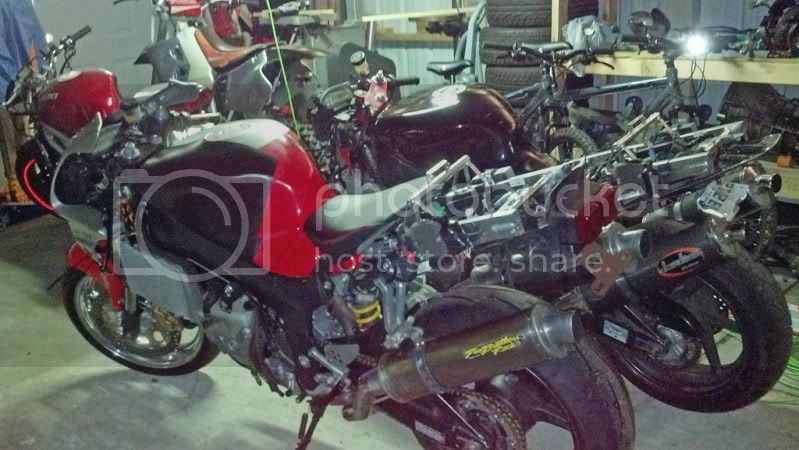 Once my fiancee's SV650 is off the lift for it's GSX-R front end swap the RC will go on for a while. 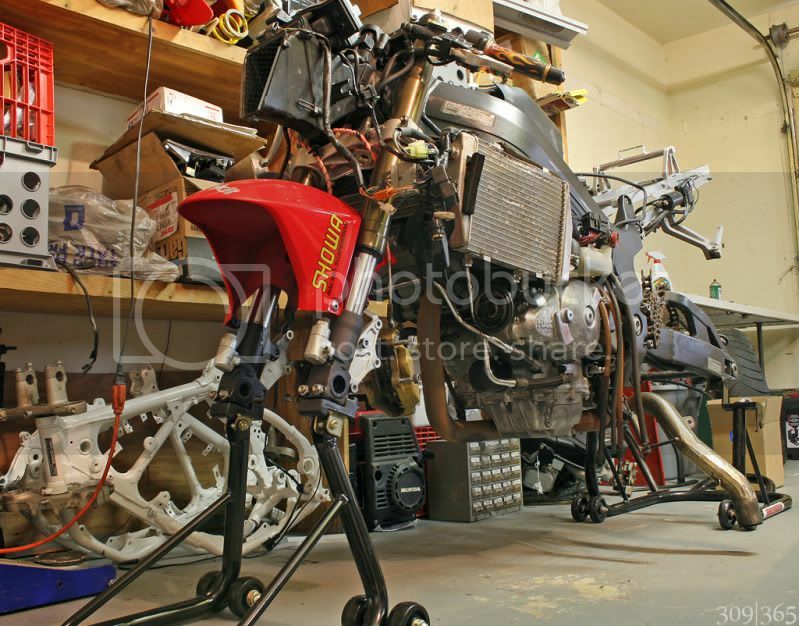 Removed the exhaust, undertail and wiring, shifter, and left rearset. 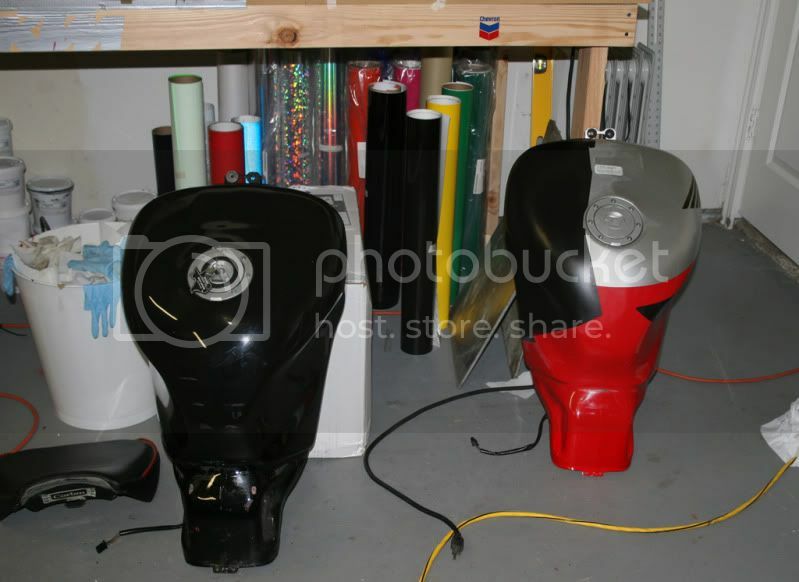 Went in halfsies with my fiancee and ordered the Eastwood Dual voltage powder coating setup to replace the Harbor Freight one we've been working with. Need to get the garage oven working so I can powder coat small items again. 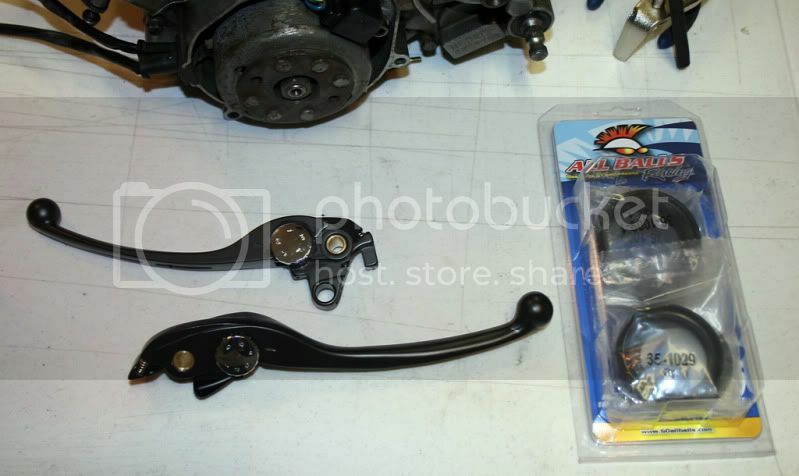 Planning on powdering the rearsets, brake brackets, and some other items satin black. 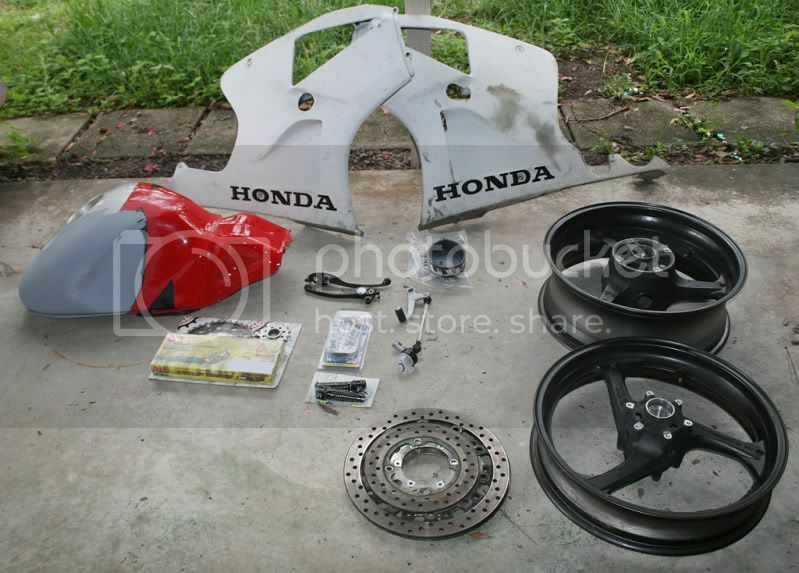 Found some CBR1000rr wheels for $200, just need to replace front bearings and make a spacer. Actually thinking might go with a red/white scheme with white wheels. Different and clean. We'll see. Nice build you have going on. Keep us informed on your progress. Damn, that's gonna be an awesome project. 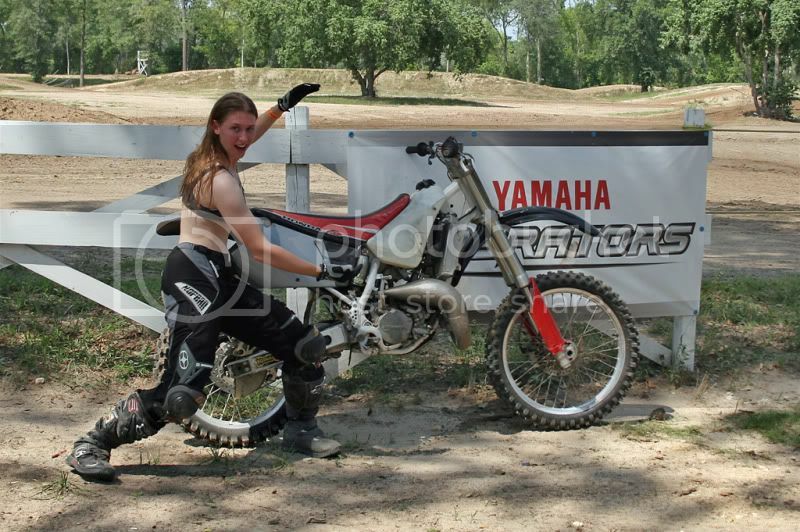 And your fiance rides and turns wrenches, you be one lucky mofo. Nice find. It's in a lot better shape than the rc project I found. Out of curiousity how much would you want for the chrome wheels shipped to Arizona? Great thread! 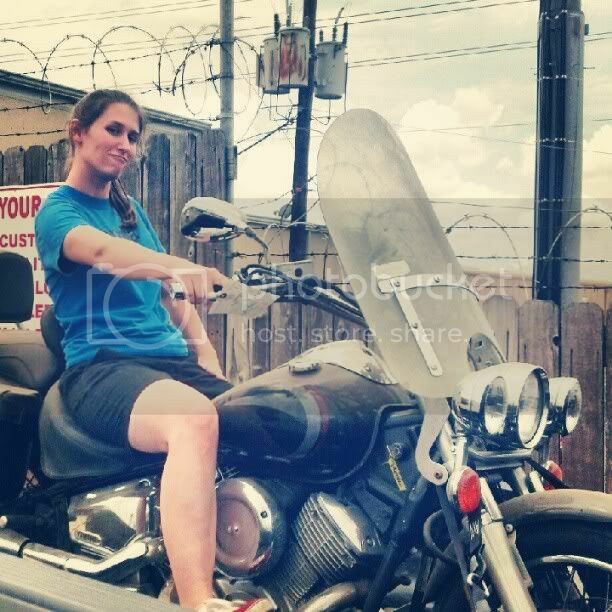 Hows the fiance feel about you having a bike that'll slap his all over the damn road? My vote is white wheels. These bikes can get bogged down the the insane amount of black. Look at Mavrick's bike, he had the white before and it really works. That's always been a kinda funny thing. Since the beginning I've had bigger bikes than him. 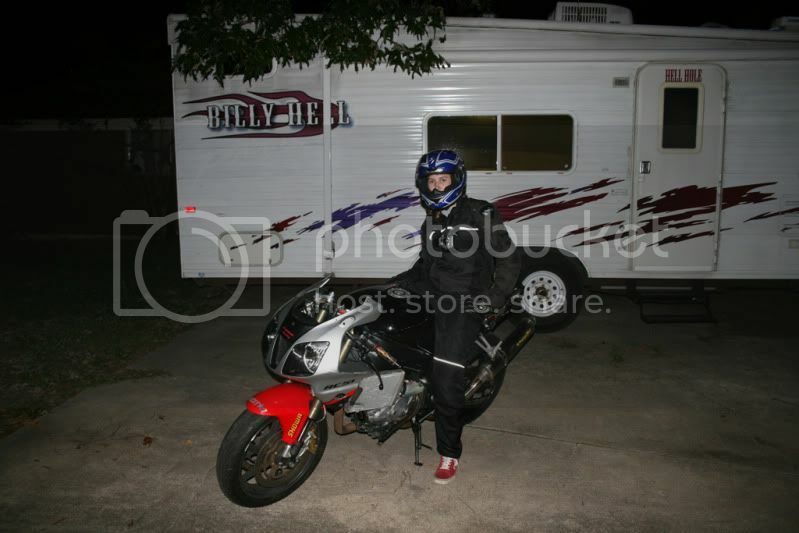 My first motorcycle was a 2001 CBR 929, his was a 1998 CBR 600. 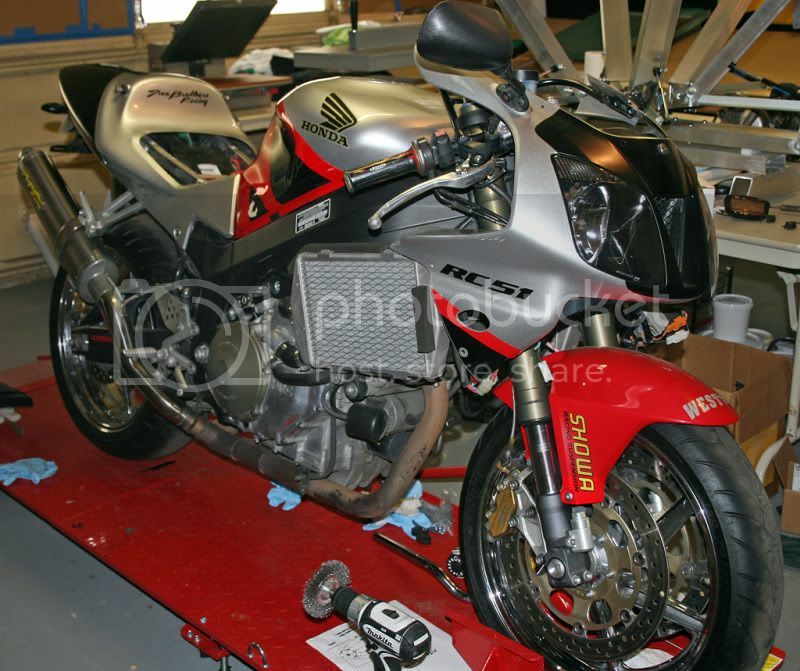 My second bike was a Yamaha R1 while he still had the F3. The only time he had a bigger displacement bike was when we owned motards; he had a DR650 and I had an Aprilia SXV550 - but mine had about double the horsepower his thumper did. We both had SVs for a while, but I was unimpressed with the power and didn't want to swap front ends to get a decent suspension. That's where the RC fell into my lap, great timing! Nice project! Get rid of the chrome wheels for sure. Keep us updated! welcome and good luck with the build. be sure to keep us updated. Yeah, i just realized it, i'm an idiot. Either, both of you ride, that's awesome. Yeah, I'm not a fan of chrome wheels, they've already been replaced with the CBR set in the photo. Project is continuing slowly! 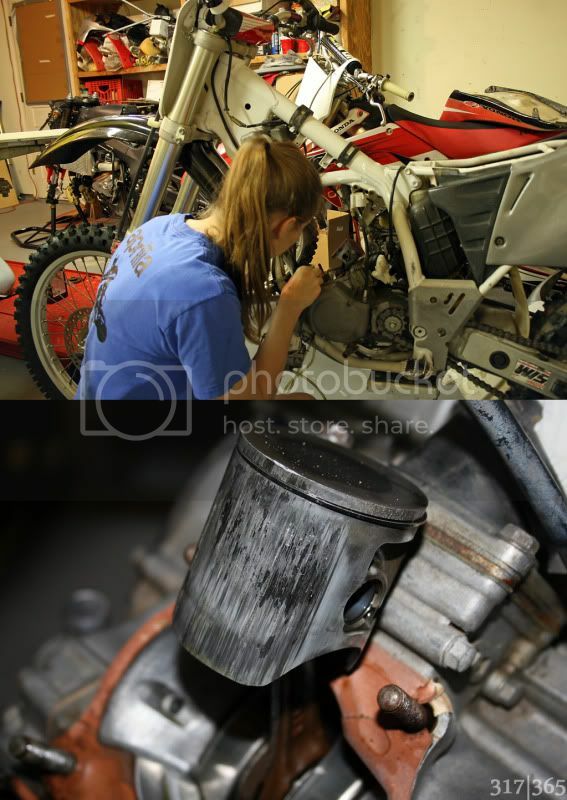 Not a whole lot of work done in the last few weeks since I got wrangled into rebuilding a CRF250 engine and had to get 3 dirt bikes running for a friend's birthday MX celebration, more on that later. 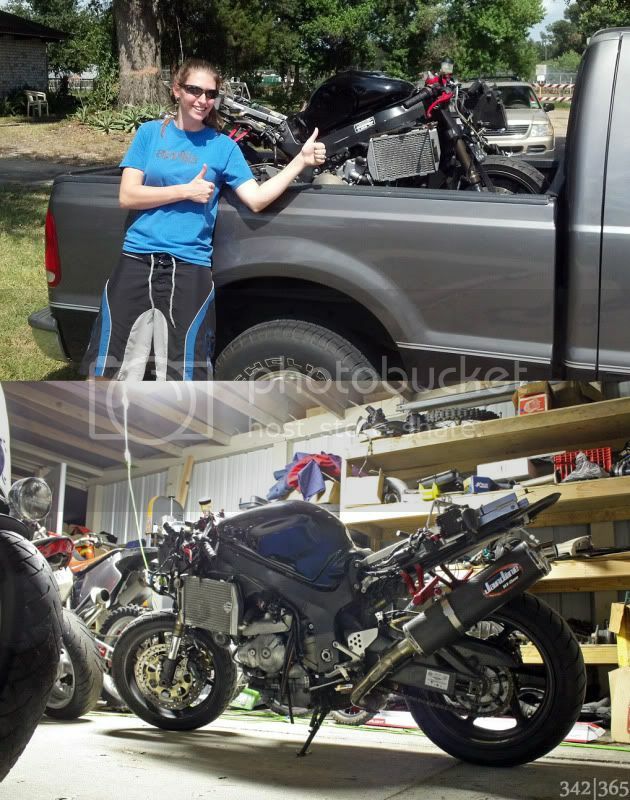 DID Chain and AFAM sprockets, clutch reservoir, brake/clutch levers, CBR1000 wheels, exhaust hangars, anodized pegs, shifter assembly, fork seals, OEM side fairings, and 190/55 120/70 Dunlop Q2 tires have arrived and the tank is back from bodywork! Wanted to put in a good word for House Of Paint on the tank and tires! 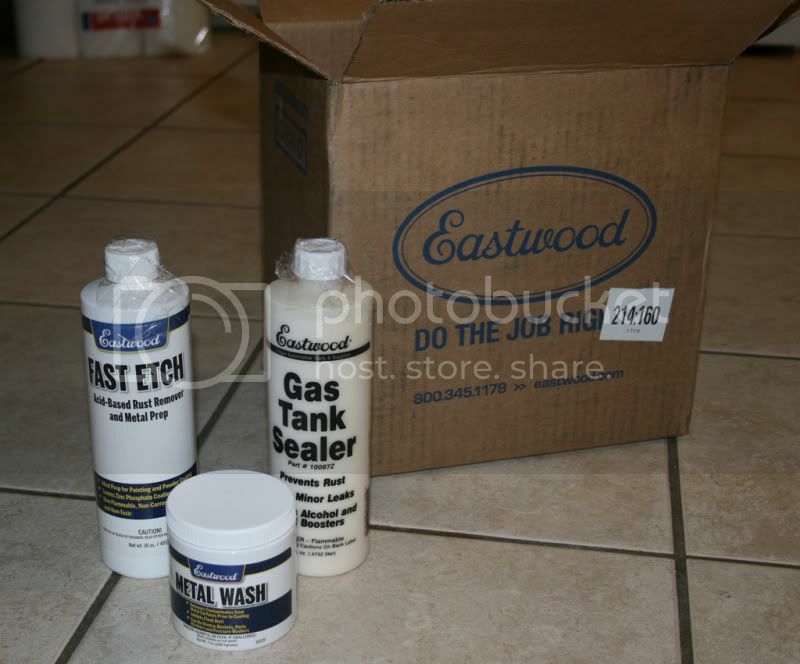 Ordered in the Eastwood tank prep and sealing kit since the tank was welded on. Spent a day with a toothbrush, S100, and a pressure washer cleaning all the nooks and crannies. Full of dirt from the wreck and little care. 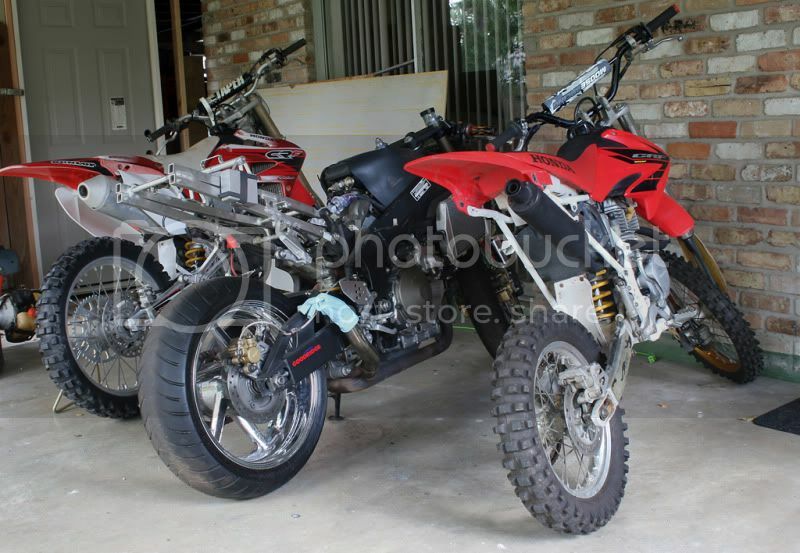 The RC all clean sitting with it's MX brothers - to the left a 2004 CRF250 "Pheonix" and to the right a conversion 1997 CR80 chassis and 2004 CRF100 engine "Frankie"
For the work I inherited the CR80/CRF100 bike Frankie project bike of my fiancee's (in the photo above on the right). Sweet little pit bike. And back to the RC! 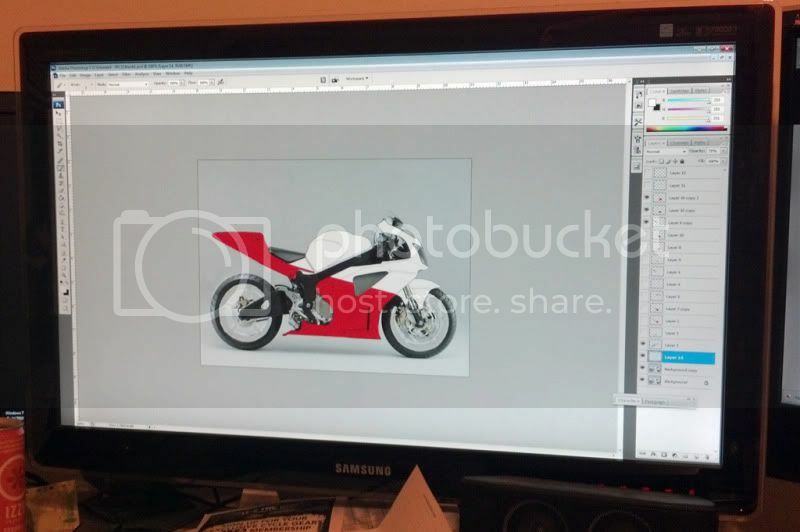 At the moment the plan is to work on having some captive spacers made for the CBR1000 front wheel so it will interface with the RC's smaller front axle. 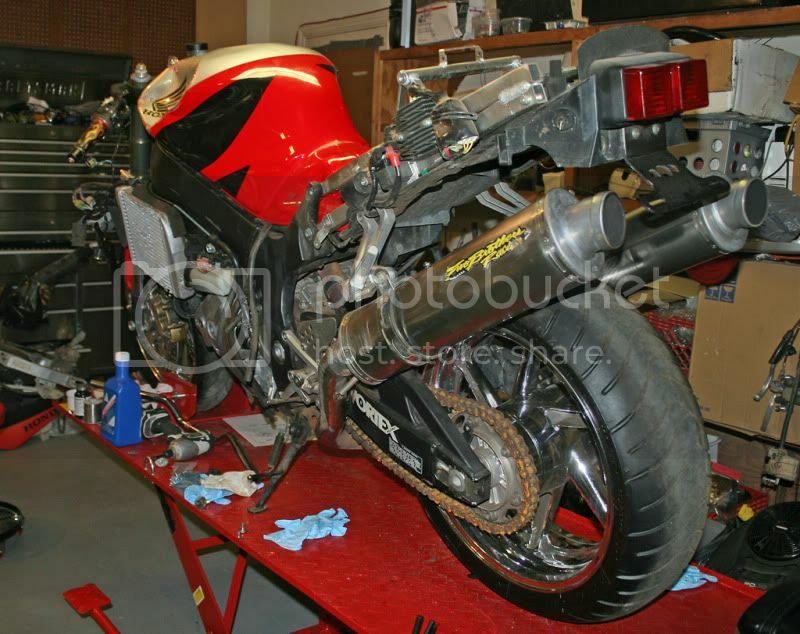 Mount up the tires w/o powdercoating, put on the ugly side fairings as-is, clean and seal the tank and mount it before paint, mount shifter/pegs/clutch cup, levers, reassemble the bike with the rashed dual Two Brothers exhaust and RIDE the RC for the first time. Want to make sure there isn't anything I need to troubleshoot before all the beautifying happens. Been a while since I've updated. Rode my RC for the first time today! She's ugly on the outside but primo where it counts. Been a long couple of weeks with work and other bikes getting in the way. 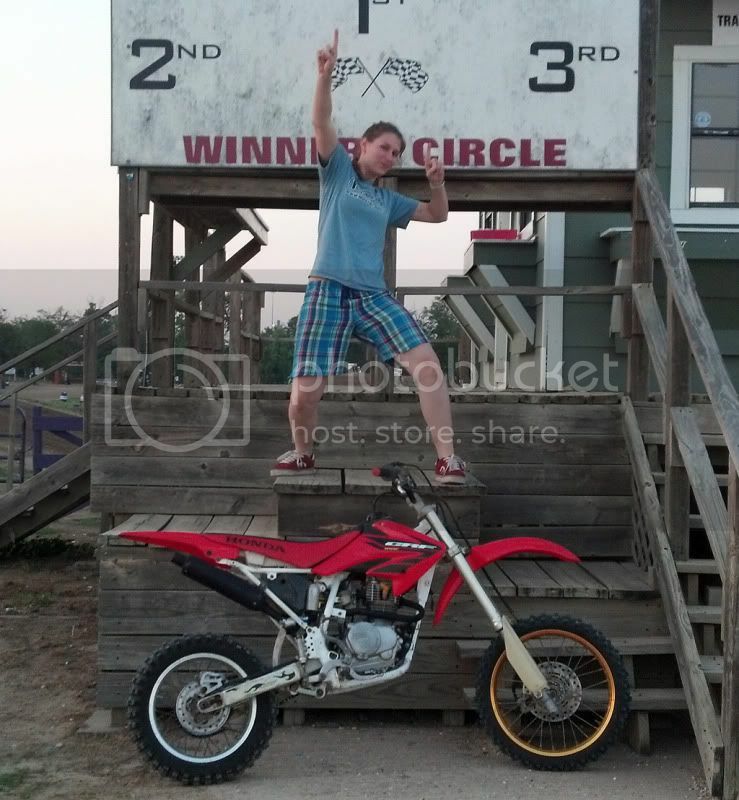 My 97 CR125 decided to kill it's top end the last time I rode MX a few weekends ago. Picked up a cheap Vstar 1100cc from a family friend that needs work. Waiting on wheels/wheel bearings and a lot of other misc work. 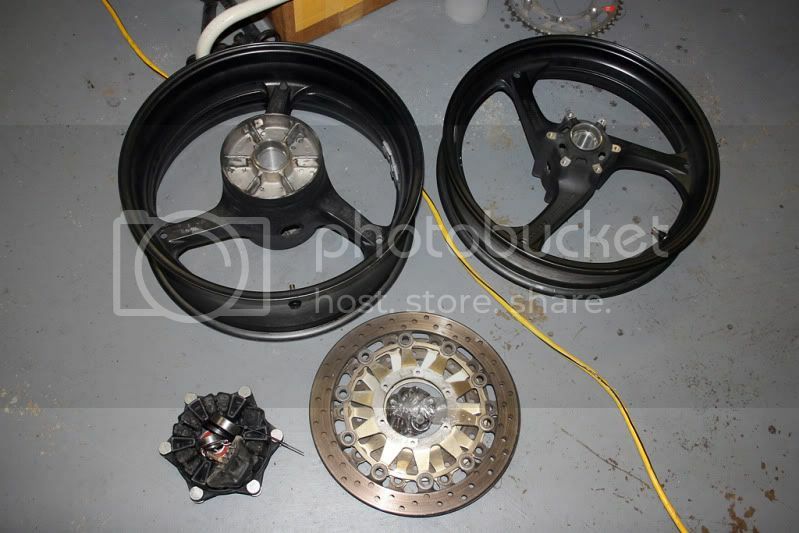 Took a while to figure out the spacer sizes I needed for the front wheel and finally got them on order July 24th. Sealed the tank, but as I was warned I wasn't impressed with the outcome. Followed directions and in the end the viscosity and drying time of the sealer was screwed up. Rusted/welded area is sealed and the sealer hardened at least. Will have to see if I have clogging issues. Didn't want to take any chances with moisture making its way through the primer and filler to the weld on the outside so I sealed it with actual paint. Will be repainting the bike with automotive paint anyway so for now it has a black splotch. Looks better than the primer and it was all I had laying around anyway. 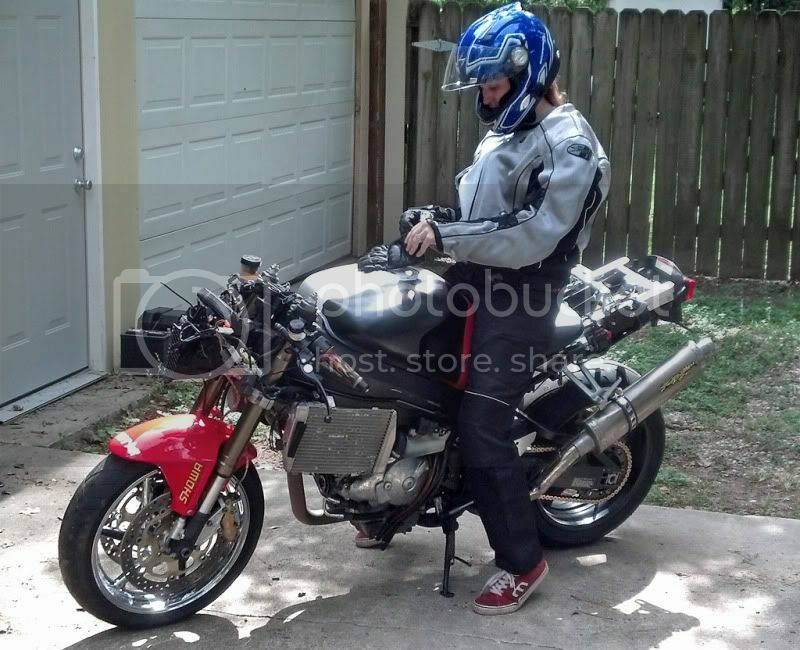 My fiancee helping me torque the new AFAM sprocket on the Dunlop Q2 wrapped CBR rear wheel. All new wheel bearings installed. Replaced old plugs and air filters with fresh new ones while I had the tank off. 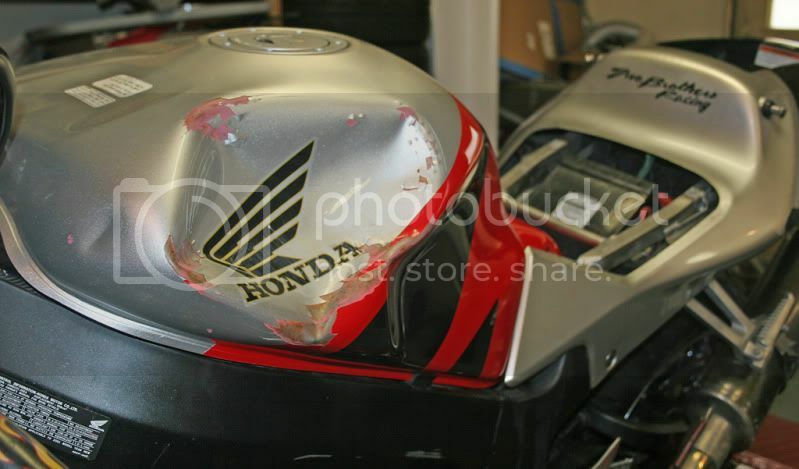 Picked up a cheap rashed front fairing with light holes intact. Grabbed some gear in case it decided to punt me off on the first neighborhood ride today. Rode and pulled good under 50MPH. Wasn't willing to go faster without a plate and still running the old front wheel/tire while I wait for the CBR wheel's spacers to come in from my machinist hookup. As she sits right now. This project proves you don't have to be pretty to be loved. 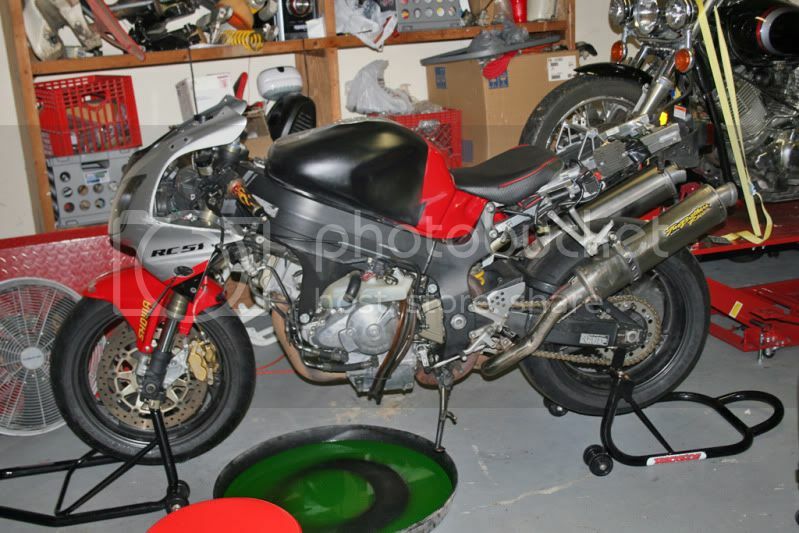 Even missing all bodywork, splotchy paint, old front wheel, and road rashed exhausts the bike is still a performer. Unlike so many bikes that look like this, my RC is clean on the inside with fresh fluids, new plugs, new filters, new DID chain and AFAM sprockets and new wheel bearings. First time it has been ridden since it was wrecked by the previous owner. Started up instantly, got to love a Honda. Here is a video of my fiancee riding right after I rode it for the first time. Makes a great sound! Fixed the idle and found out the fuel pump gasket started to leak when I put more gas in the tank. 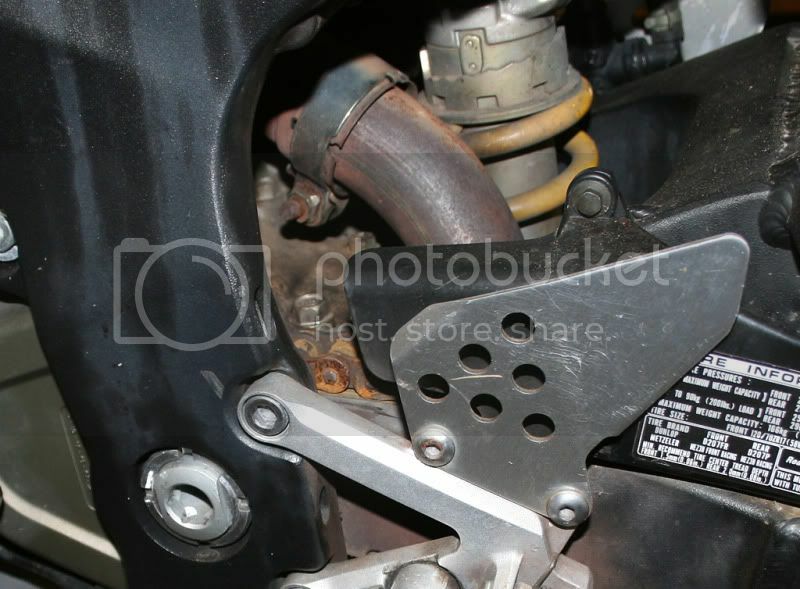 Pulled it off, siphoned out the gas, and got a gasket on order. Guess I'll prep and paint it while it is off and empty. 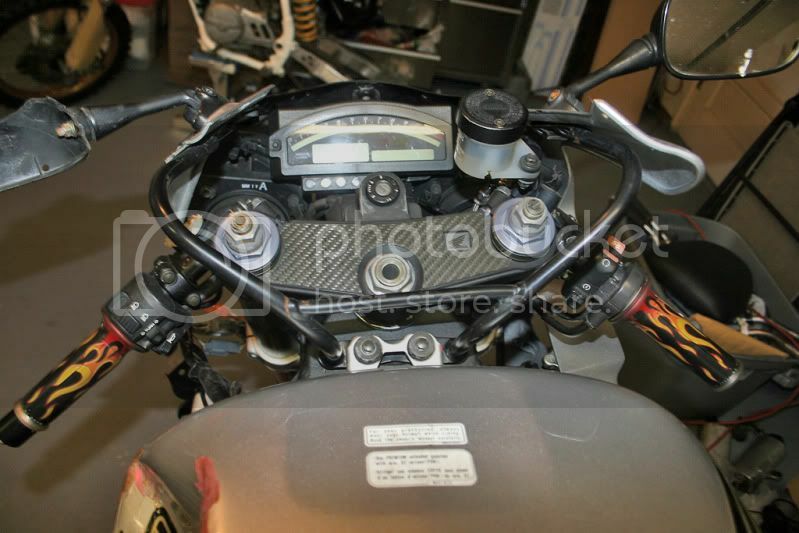 Also ordered a Zero Gravity double bubble windscreen and some frame sliders. 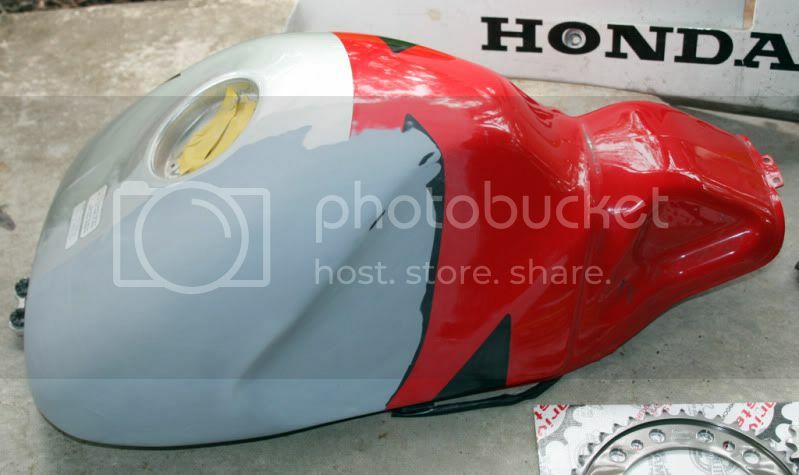 Test fit the fairings before I started bodyworking them. good work, welcome to the family. there is a lot of information, ideas and great people here on this site. Been a long project, finally rode my RC yesterday. More to report soon. I think me and this bike will get a long fine. 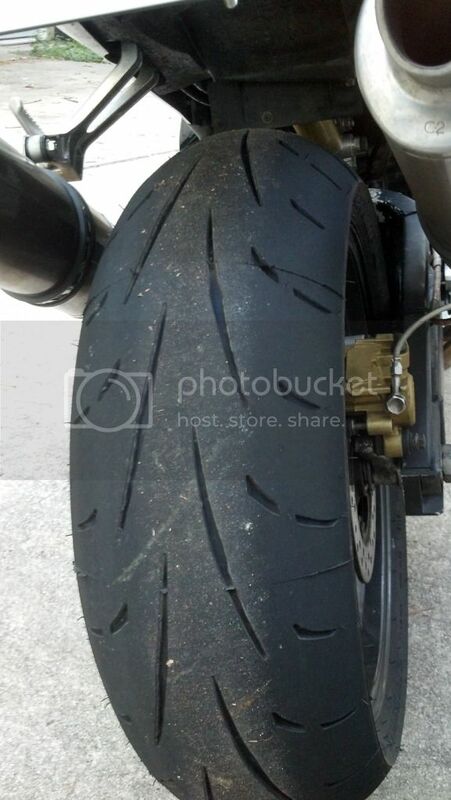 Eliminated chicken strips on new tire. Good work. What's the buddy for, another project, or parts bike? where are you finding these wrecked rc's? Nice project by the way. 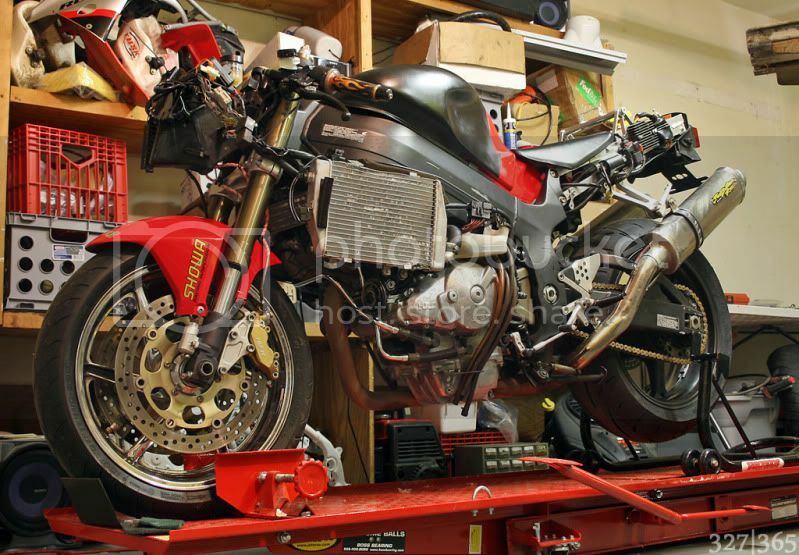 I actually followed your aprilia build over on smj. ^ The other wrecked RC was a quick find on local craigslist. 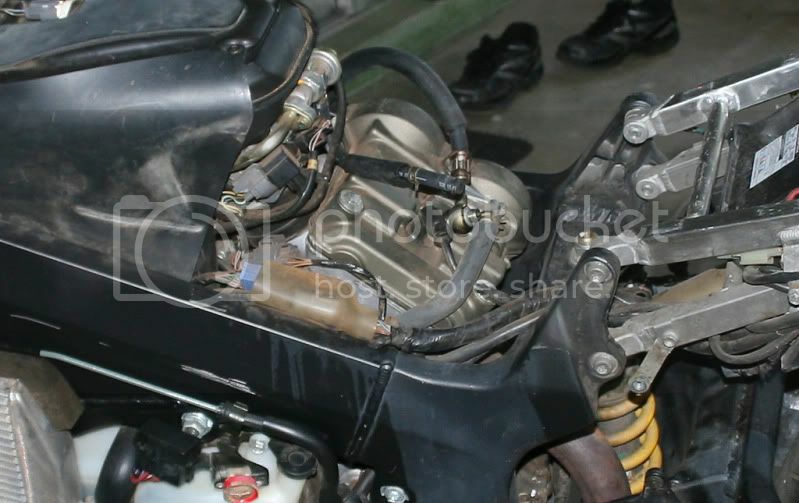 It is a 2003 frame with all other SP1 parts. Was listed for $1800, offered $1k and the guy took it, we were at his house within an hour. You think my 2001 was janky...wow, the new RC takes it in spades for jankyness! You should see where my 'priller is at now! A guy in Kansas bought it who does custom cycle work and has been keeping me updated. He continued murdering it out with all the primo parts (wheels, suspension, plastics, etc etc). Pretty neat seeing it taken care of. Now that I have some time I wanted to post my full report. -Most stable motorcycle I've ever ridden, holds the line like a bauss! I can roll up to stop signs and stop without putting my feet down most of the time. 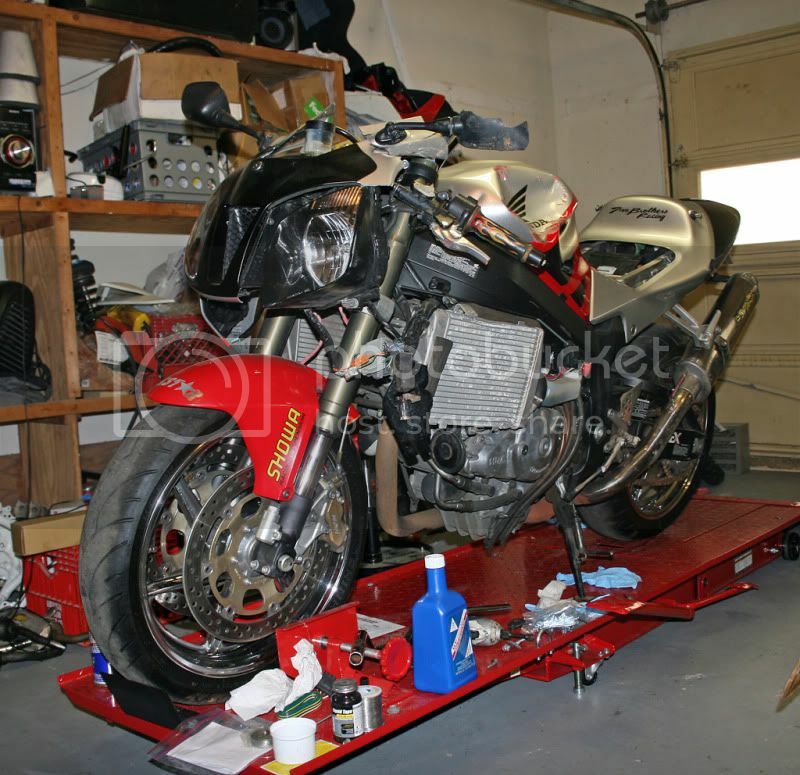 -Easy to lean comfortably, first bike I eliminated the chicken strips on the first ride. -Needs more power up top, punch down low is excellent. Had my R1 buddy off the line, but the RC peters out with it's flat power band up top. I have not done the flapper valve or soft rev mods yet. After owning a few inline sport bikes I do miss the 'turbo' punch up top. However the power band adds to the bike's easy rideability. 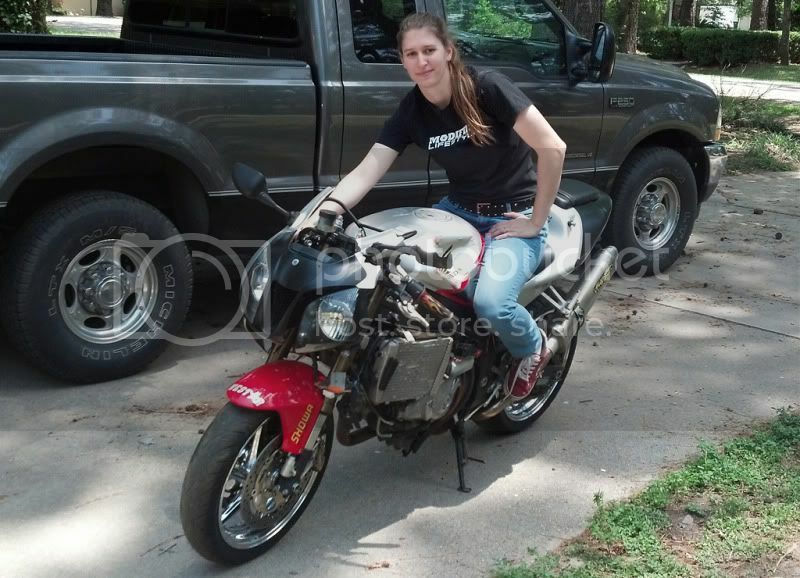 -Heavy steering, my lady arms were sore after a few hours of cornering. -Seating position is nice for high speed, but I don't like how the tank front easily gets in the way of parking lot steering. 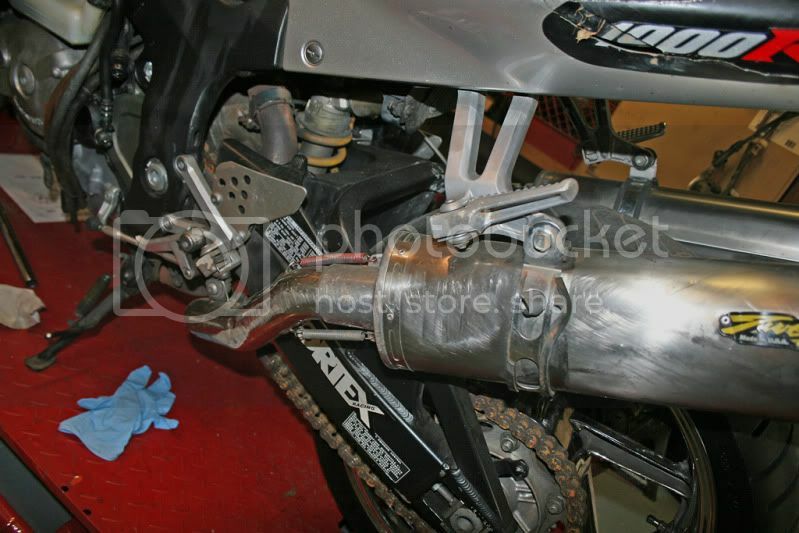 -Exhaust note with the Two Bros, to quote a friend, "sounds like a Harley and a race car got it on!" 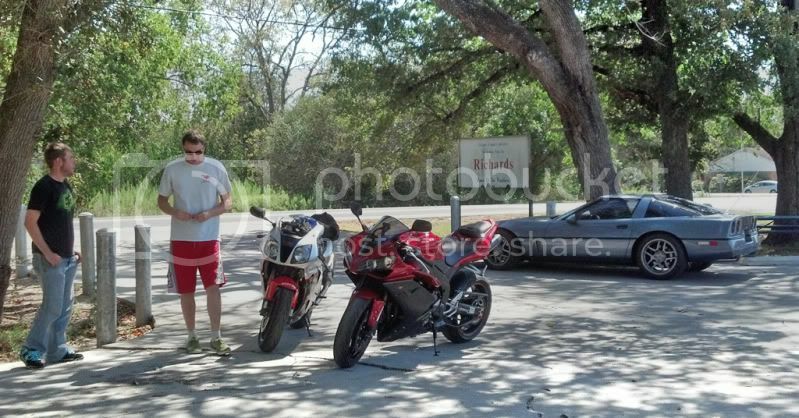 He said he could feel the bike coming up behind him while he rode his R1. Badass. To the recent build pics! 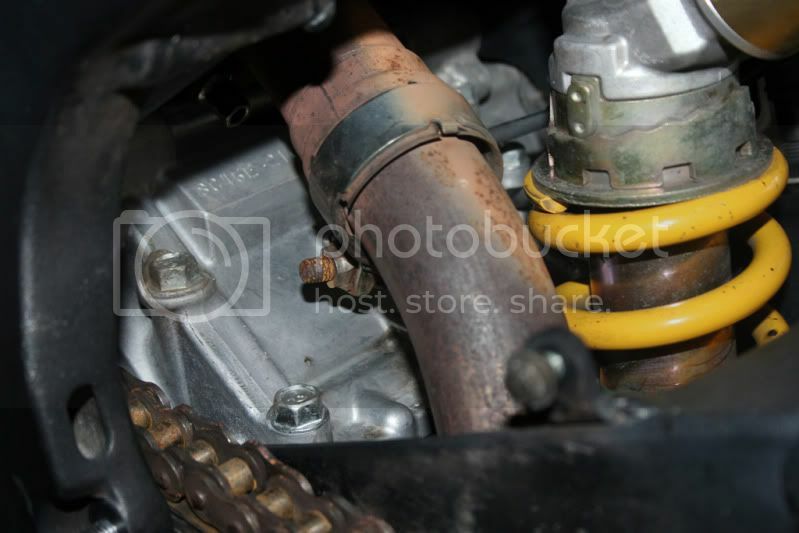 The left radiator had loose mounts after the previous owner's wreck and the placement was interfering with the steering. 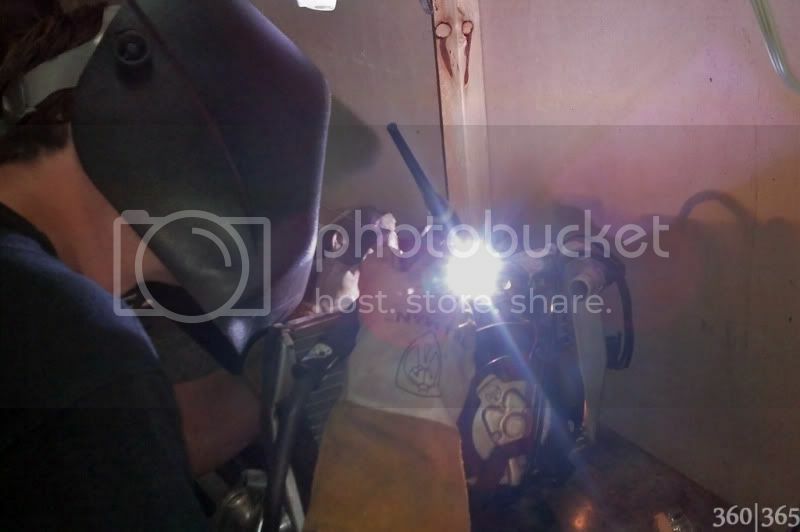 Ian tig welding the top and bottom radiator mounts back to stock placement. The story behind the second RC I posted seems to be ever changing. I found it on the local craigslist listed for $1800, had recently been down on it's right side. Said wth and offered the guy $1k and he took it after some haggling. We were at his house filling out the paperwork within an hour. 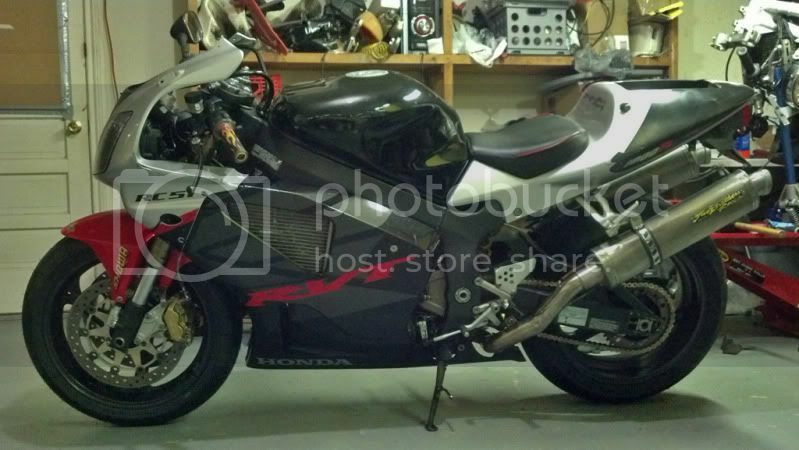 It has a 2003 SP2 frame and all the rest of the parts are SP1. Has a salvage title...looks like it might have been a theft recovery and a wreck. 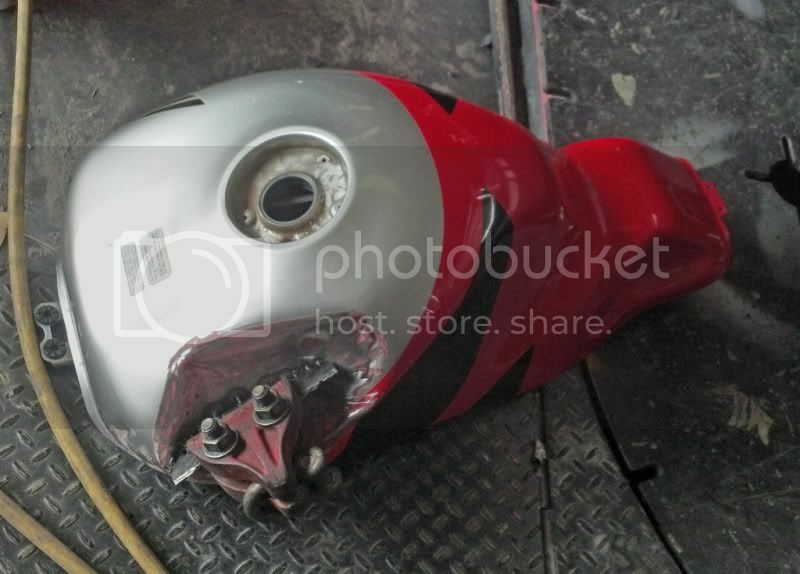 Originally bought it to use the good parts for my bike (Power Commander, Corbin seat, unbodyworked tank, non-chrome SP1 wheels, etc), fix, and sell for profit. 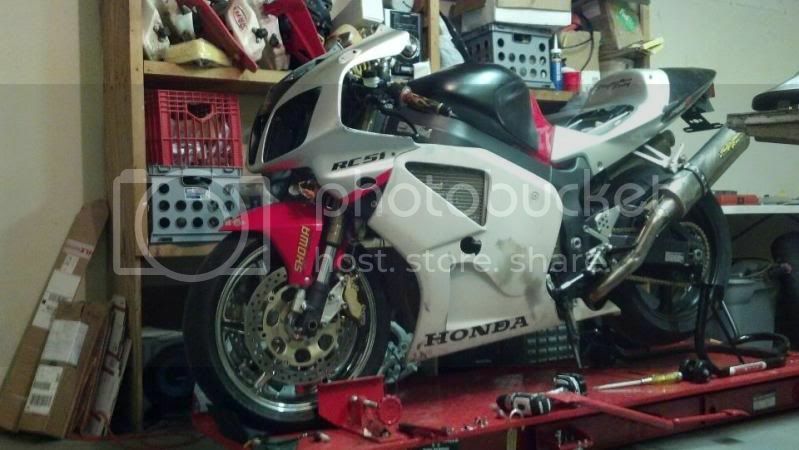 But now it's looking like my fiancee will be working on getting it running and ridable to keep up with me and our R1 buddy. 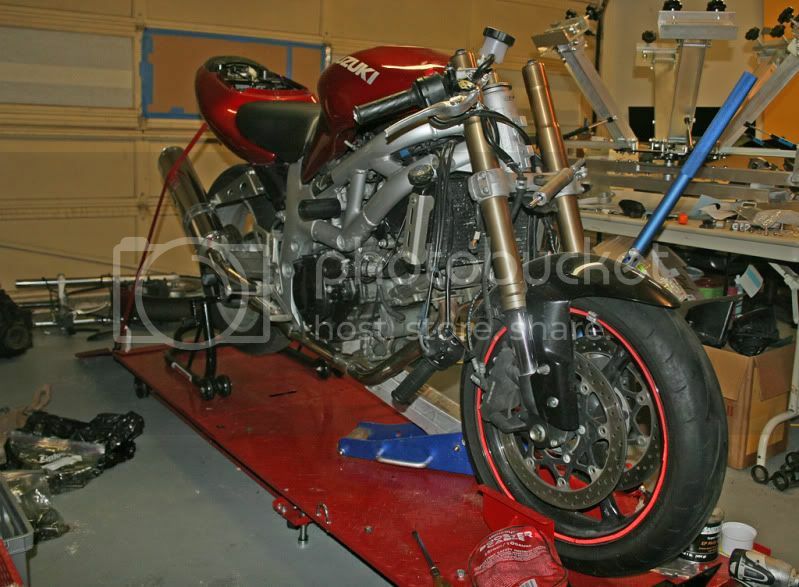 Getting the front CBR wheel to fit has been a PITA. 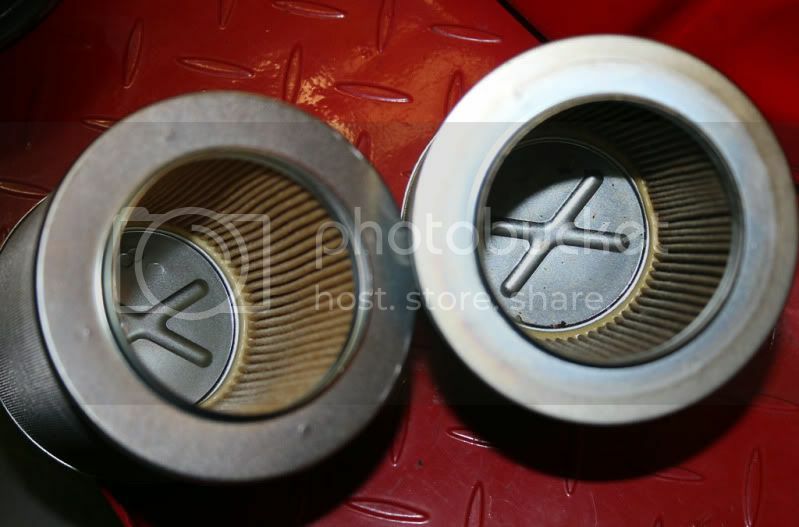 We had some spacers made by a friend, but it turned out the outer diameter was too big to fit the dust seals. 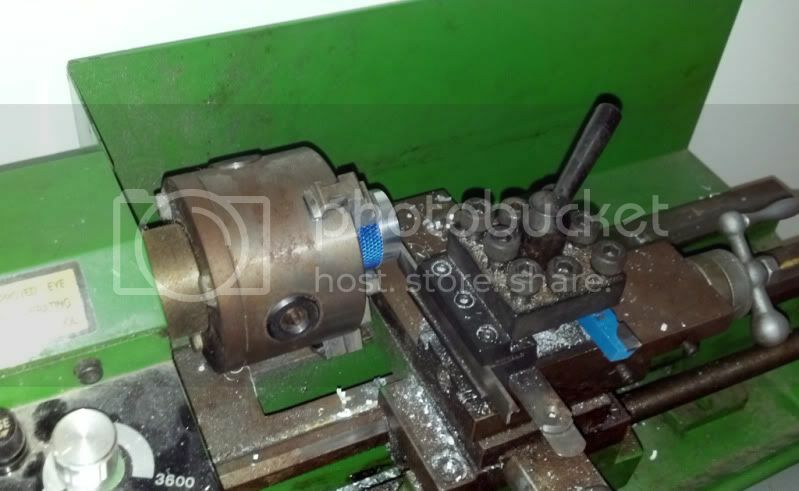 Here we're using a relative's lathe to fix that. 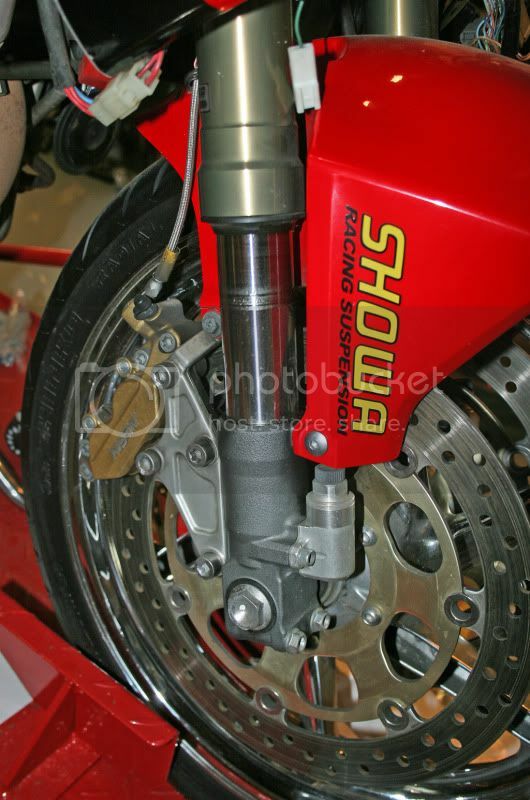 Once we were able to install the new wheel bearings and spacers we also found out the overall spacer width was correct between the forks. But the math was messed up with the bearing offset and the wheel was 1/10th of an inch off center. Machined more off the smaller left spacer, then found the our aluminum jack handle had the right inner diameter to add to the larger right side. 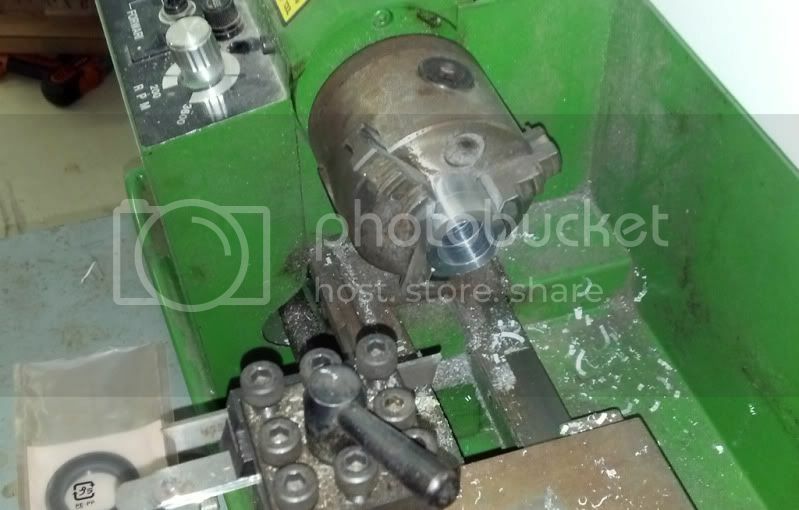 Chucked it in the lathe and machined an extra little spacer. Viola! Swapped the new RC's tank onto my bike. 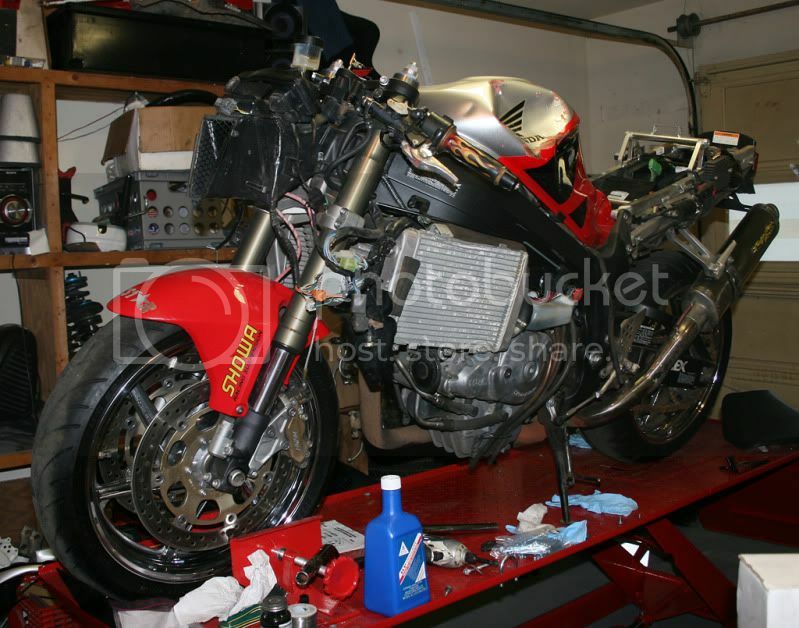 No bodywork and no tank sealant! Took the SP1 power commander out of the new RC and took mine out for a test run. Less popping, better power delivery. No license plate yet so could only ride in the neighborhood. Needed some high speed pulls yet. Ian soldering the license plate light before inspection and registration. 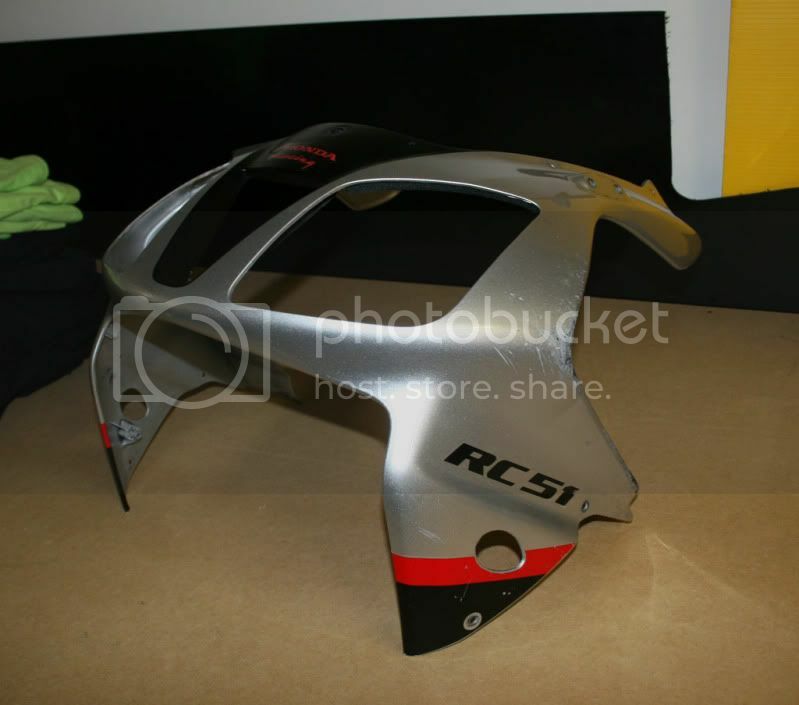 The other RC came with one good left fairing so I took it too. Still looks janky, but wow this is a fun bia to ride! Lots of work left, but pleased to have a good riding bike. Labor Day ride; my first real ride on my bike. Ian's SV was sitting in the garage with no front end so he took my father's C4 Corvette to chase the RC and the R1 out in the forests.